An Israeli soldier stand by a tank near the border with Syria in the Israeli-controlled Golan Heights, Monday, Nov. 28, 2016. Syria and Russia say two Israeli war planes operating in Lebanese air space carried out an attack early Monday on an air base in central Syria. 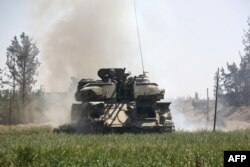 Israel's military did not comment on the strikes against the T4 base in Homs province. The Britain-based Syrian Observatory for Human Rights said 14 people were killed, including Iranian forces. In February, Israel accused Iranian forces of using the same site to send a drone to Israeli territory. It responded by attacking Syrian air defense and Iranian military targets within Syria, and Israeli Prime Minister Benjamin Netanyahu pledged to "continue to harm anyone who tries to harm us." Russian President Vladimir Putin, right, meets with Israeli Prime Minister Benjamin Netanyahu in Moscow, Russia, March 9, 2017. 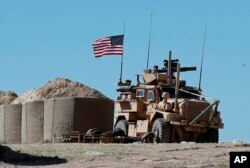 Initial Syrian state media reports Monday blamed the United States, which along with France denied responsibility. "However, we continue to closely watch the situation and support the ongoing diplomatic efforts to hold those who use chemical weapons, in Syria and otherwise, accountable," Pentagon spokesman Christopher Sherwood said in a statement. Syria has repeatedly denied using chemical weapons throughout the conflict that began in 2011, including the most recent suspected chemical attack Saturday in a rebel-held suburb of Damascus that killed at least 40 people. Late Sunday, the White House said President Donald Trump and French President Emmanuel Macron strongly condemned chemical attacks in Syria and agreed Syrian President Bashar al-Assad's government "must be held accountable for its continued human rights abuses." "They agreed to exchange information on the nature of the attacks and coordinate a strong, joint response," the White House said about a phone call between the two leaders. Macron's office added that the two sides "exchanged information and analysis confirming the use of chemical weapons." Trump used Twitter earlier Sunday to say there would be a "big price to pay" for what he called the "mindless chemical attack" Saturday. In this April 4, 2018 file photo, a U.S. soldier sits on an armored vehicle at a newly installed position, near the tense front line between the U.S-backed Syrian Manbij Military Council and the Turkish-backed fighters, in Manbij, north Syria. In a rare direct condemnation of Russia's leader, Trump declared, "President Putin, Russia and Iran are responsible" for their support of "Animal Assad." He further called for Syria to open the area of the alleged chemical attack to allow in verification and medical teams. The Russian foreign ministry rejected claims of a chemical attack, saying, "The spread of bogus stories about the use of chlorine and other poisonous substances by (Syrian) government forces continues. "We have warned several times recently against such dangerous provocations," the Moscow statement said. "The aim of such deceitful speculation, lacking any kind of grounding, is to shield terrorists and to attempt to justify possible external uses of force." Iran said U.S. claims about the attack were aimed at justifying new American military action. A year ago, after an earlier chemical weapons attack by Syria, Trump launched 59 Tomahawk missiles into Syria, targeting the military base that was home to the warplanes that carried out the attack. Trump did not say how the U.S. might respond to Saturday's suspected chemical attack. But Homeland Security and counterterrorism adviser Thomas Bossert told ABC News, "I wouldn't take anything off the table." The United Nations Security Council will meet Monday about the alleged attack, after nine countries demanded an urgent session. The European Union said "evidence points toward yet another chemical attack" by the Syrian regime. Trump also said that if his predecessor, former President Barack Obama, "had crossed his stated Red Line In The Sand," to hold Assad accountable for previous chemical attacks, "the Syrian disaster would have ended long ago! Animal Assad would have been history!" Trump's rebuke of Putin was unusual. The U.S. leader has been reluctant during his nearly 15-month presidency to accept the conclusion of the U.S. intelligence community that Putin directed a 2016 campaign to meddle in the U.S. presidential election to help Trump win. U.S. special counsel Robert Mueller has been conducting a wide-ranging criminal investigation of the Trump campaign's links to Russia, but Trump has repeatedly rejected the notion there was any collusion with Russia. The alleged chemical attack occurred late Saturday amid new attacks on the last rebel enclave in eastern Ghouta. First responders said they discovered families suffocated in their homes and shelters with foam on their mouths. Relief workers said more than 500 people, mostly women and children, were brought to medical centers with difficulty breathing, foaming at the mouth and their eyes burning. The Civil Defense and Syrian American Medical Society said patients gave off a chlorine-like smell, and some had blue skin, an indication of oxygen deprivation. Pro-Syrian regime forces advance toward the town of Douma, the last opposition holdout in eastern Ghouta, April 7, 2018. "Dropping poison gas in a way that attacks women and children down in the shelters is a way to try to panic the civilians into leaving and cut the ground underneath the rebels," University of Pennsylvania political science professor Ian Lustick told VOA. Trump's rebuff of Putin and Iran, which has forces in Syria, came as Syrian state television said Sunday an agreement has been reached for rebels to leave Douma, their last stronghold near Damascus. The accord calls for the Jaish al-Islam fighters to release all prisoners they were holding in exchange for passage within 48 hours to the opposition-held town of Jarablus in northern Syria near the Turkish border. Russia said last week that Jaish al-Islam accepted a deal to leave Ghouta, which houses tens of thousands of people. However, the evacuations stalled over reports that the rebel group remained divided over the withdrawal. The pact was reached just hours after the suspected chemical attack.